In 1938 at Vienna’s Heldenplatz, Hitler celebrates “The Anschluss” of Austria to the German Reich in front of cheering crowds. 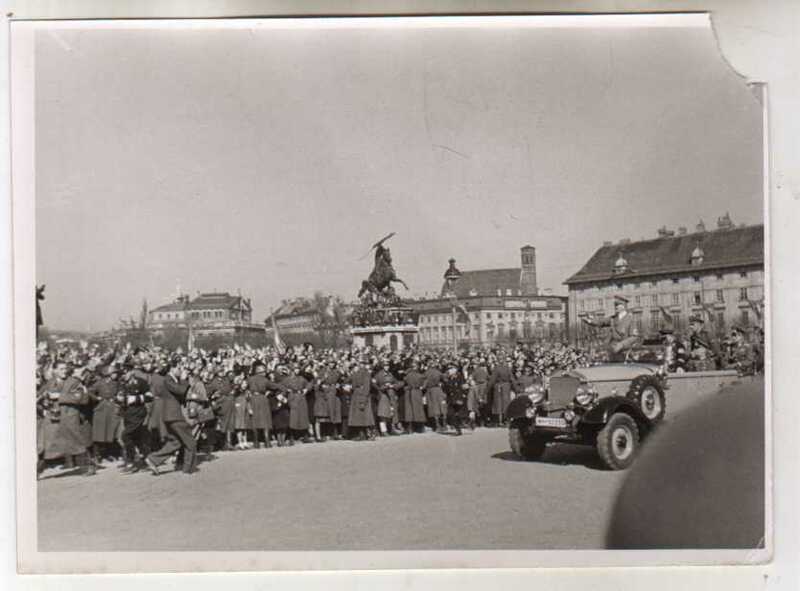 Hitler arriving at the heldenplatz for his speech to the Viennese from a balcony of the Habsburg palace, the Hofburg, on 15 March 1938. In the background is the heroic statue of Archduke Karl. Russian Soldiers at the Heldenplatz in 1945. The place where once Hitler in 1938 declared Austria “Heim in Reich”. Cheering people at Hitler’s Victory Pararde in 1938 at the Vienna Ring in Vienna. Courtesy of Schloss Schönbrunn Kultur- und Betriebsges.m.b.H.